Bordiga's analysis of a fatal environmental catastrophe in Italy, which could easily been avoided, had importance been placed on safety rather than profitability. 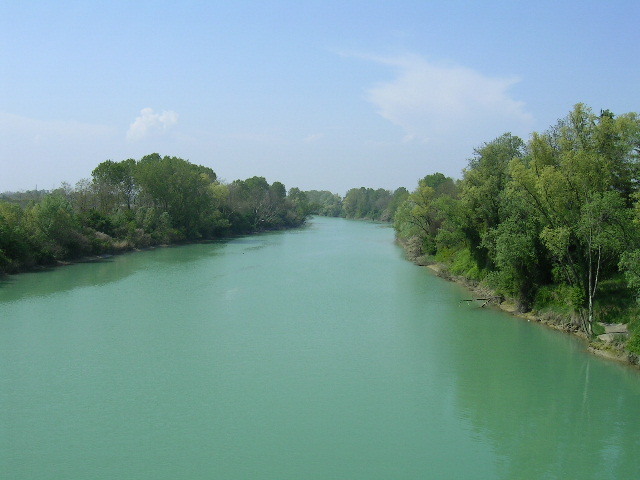 The patriotic saga of Italy raised the Piave to the status of the national river, and designated it as such, in 1917. In the war which was to have been the Fourth War of Independence, leading the country in a leap beyond the Venetian frontiers (won by no means by armed might) already gained from the Third. After two years of an immobile front on the Isonzo, streaming blood from a dozen battles, the direction then changed with the famous defeat at, and flight from, Caporetto, with the Austrians flooding onto the plain through this breach. After a few days of fearing for the worst when it was believed that they would only have been stopped on the Adige or Mincio, on the 1859-66 frontiers, the tide was stemmed on the Piave, something that was foreseen by the not altogether stupid titch of a Ring who organised the defence. We all then learnt that the Piave was to be declined as a masculine, not as a feminine substantive, laying to rest our schoolboy doubts. The river's name entered popular poetry and legend. The old Neapolitan versifier E.A. Mario, recently passed on, wrote verses and music which lost only by a short head to Mameli's hymn in the competition for the national anthem. Can you recall the ingenuous phraseology? "Together with the infantry, battled the waves". Once again a river was personified in literature, like in classical literature, as defending the motherland, carrying to the sea piles of enemy corpses. "The Piave whispered: the foreigner shall not pass". But now the Piave has carried out to sea thousands of Italian corpses struck down by the apocalyptic flood from the Vajont during the dark night of October 9-10th, and has lost its title to nobility. Its legend was and is one of death, and there is no more glory in carrying away the bodies of soldiers than of peaceful citizens caught in their sleep. Then they were immolated to the never satiated with blood numina of war, now to those of modern bourgeois and patriotic capitalist civilisation and above all to the adorers of its science and technology. It is not just today that we suddenly desire to dishonour, along with those of wars between peoples, the no less infamous killer deities of a civilisation which rusts and rots year by year. In Prometeo, 2nd series no. 4, July-September 1952 we dedicated the article Politics and Construction to this theme which, among the various examples of deadly disasters which constitute real bankruptcies of scientific technique, recalled several cases of floods and cited historical cases of mountain reservoir dams, recalling the history of this skill from the Moors in Spain and Leonardo to the organisational inadequacies of the modern hydraulic services in the period of great capital and monstrous construction enterprises. In France in 1959 there was the terrible Frejus catastrophe which, nevertheless, despite the collapse of the dam which did not happen in the case of the Vajont basin, caused fewer victims than the recent Italian catastrophe. Then we found the person responsible, the accused to be stood in the dock, but not in the manner of the reckless pettifogging political prick of demagogic opportunism: it was Progress, the lying myth which makes the poor in spirit and the starved wretches bend their backs to it, ready to swear loyalty to this Moloch which every so often and a little bit each day crushes them under the wheels of its obscene carriage. In the inhuman system of capital, every technical problem boils down to an economic one, that of the prize to be won by cutting costs and boosting returns. The old pre-bourgeois societies had some residual time to think about safety and general interests. As we recalled in the case of the Frejus dam, that too was a masterpiece of brand new technology, it was light, slim and agile and so with a very modest concrete and steel tonnage held back an enormous volume of water. But already past-builders had realized that dams work by gravity, that is, they resisted the incredible thrust of the liquid in that they were extremely heavy and so did not collapse. We recalled that after several disasters in Spain and at Gleno in Italy (1923) the theory was modified to take account of the hydraulic thrust below, at the base of the dam and these were broadened and made more stable. But the recent dams have obeyed (a mercenary science has obeyed) the sacrosanct need for low costs, so they are built, as with the Frejus and Vajont, in an arch, that is, with a curve that points out into the water pressure and spreads the load onto the shoulders wedged into the valley sides. The dam thus becomes less voluminous, less heavy and less costly and is made of highly resistant materials. But then the pressure of the thrust on the two shoulders of the construction grows massively because this depends on the water pressure borne on its back, which is all the more massive the higher the dam is. Allowing for superlative materials permitting the slimming of the dam and therefore of its shoulders, the pressure on the natural rock is immense and the problem ceases to be the, controllable, one of adjusting the arch of reinforced concrete to take the thrust (this cannot be reduced), but of seeing if the rocky sides will crumble, ruining the arch shaped dam. This was the error made at Frejus. Then too it was not the mechanical and hydraulic engineers who were wrong, but "” it is said "” the geologists called on to evaluate the strength of the rock. The first problem can best be tackled by mathematical calculations, performed either by a good theoretician or by a computer, while the great theoretician sitting at it goes through a few packets of cigarettes. It can be tested on a suitable scale model in the laboratory. The geological problem is not one for the smoking saloon or the test tank. It is one of lengthy human experience based on the proofs of historical building. Human and social experience. For all modern engineering, in so far as it makes things which are not pocket sized or cars, constructing things fixed to the Earth's crust, the key problem is the land/building relationship (for a simple house, the foundations). There are no perennially valid formulae but instead many skilful applications to choose from after gaining hard-learnt experience. Taking a big salary and smoking in front of the computer is not sufficient. This experience ripens over the centuries: whoever believes in progress and in the jest that last season's latest discovery contains the wisdom of all time, may get a big salary, but causes disasters, statistics for which, and they alone, show progress. The very folk traditions among the uneducated masses, the place names themselves can help the geological expert (if it really was his fault) or, rather, the good engineer. Why ever was the Frejus narrows called Mal Passet: a bad step indeed. The mountain overlooking the reservoir and which slid into it causing the terrible overflowing, why was it called Monte Toc? Toc, in Venetian, means piece: it was a rock that split off in pieces and all the inhabitants of the valley expected the landslide. Vajont, the name of the reservoir, but previously of the pass, the gorge in which the dam was wedged, all 263 meters (world-beating historical record! ), in Ladino Friulian dialect equals the Venetian va zo, goes down, which collapses into the valley. In fact past landslides have been mentioned, by the poor inhabitants living on them. Uortami, the geologist, in denying indignantly that he would ever have consented to the selection made for the dam site, stated that the choice fell to the engineers. Quite so. The philosophy of the two tragedies of Malpasset and Vajont (among the many others) is identical. At the bottom of these reckless projects, dictated and imposed by the hunger for profit, by an economic law to which all the navvies, the surveyor and chief engineer must all bow, for which reason it is a foolish remedy to uncover the guilty party at an inquest, lies the most idiotic of modern cults, the cult of specialisation. Not only is it inhuman to hunt down the scapegoat, but also vain, since one has allowed this stupid productive society to arise, made of separate sections. No one is guilty because, if someone takes off the blindfold for a moment, he can say that he gave advice requested by the next section, that he was the expert, the specialist, the competent person. The science and skill of producing, and especially of building, will, in the future society which will kill the monster of economic return, of surplus-value production, be unitary and indivisible. Not a man's head, but a social brain above ridiculous separated sections will see without those useful blindfolds the immensity of each problem. We read the report of the engineer who for thirty years had dreamt of building the Vajont dam. The good man is dead and does not need our defence. He was interested by the purely morphological fact that with a little dam one could hold back a lot of water and nowhere else would the return be so great at so little cost. A victim of inexorable determinism. Let us leave out the details of the design work or works, the ninety hours of computer time that saved years of work by a team of mathematicians, the tales of the experiments on wood and then concrete models... Only one passage interests us, the reference to the ineluctable economic determinism. "The design selected from among many others, dating from 1956, fully exploits the valley's characteristics which seem to have been made for the purpose of building an exceptionally large dam". The valley was made to be exploited, and if that had not been the case ... one would have had to have invented it. The whole valley ran the risk, and now it is dead. The solution to this problem will never be found by the "democratic" method used by the currently available communists. They are silly solutions to these tragedies "” which only show that bourgeois, money, private initiative, market society has lived out its historical span and has by now become an even more putrescent corpse than the ones it flung into the Piave "” the ones bandied about by newspapers fed on a gutless petty-bourgeois ideology, which perhaps a hundred years ago could get by, and which claims justice, honesty and sentences for those who get it wrong or cheat. The Ministerial Enquiry, called for by the ministers who have their fingers in the pie and delegated to university professors loyal to the system of sectorial responsibility with which one has the right not to know "others' subjects" in this bureaucratic, scholastic and career-ridden system which is drowning us. The Parliamentary Enquiry in which a group of people with no knowledge and of contrasting ideologies (save that of the greed for political success and ambition, which is the same from the extreme right to the extreme left) study what they do not understand and then have a vote on it in the assembly of "politicians", that is, those who should be the first to be tipped into the dustbin so as to liberate human society. The judiciary, which knows that its job is to apply a code rooted in tradition and the latest constitution, useful for the petty thief and for the civil servant who in this case was the only one to be banged up for making public a "stolen" document which showed that the technical doubt over the dam was founded and long standing. Three degrees of tricking, not the dead, but the living that look to the horrible parties and newspapers of all persuasions and drown in the unconsciousness of their destinies. What is to be done with the dam? Another problem that the bureaucratic, democratic administrative mechanism will be unable to solve. The dam was not flattened so Engineer Semenza, if he were still alive, would be innocent, looking at it from his sector's point of view. But the problem was the stability of the valley sides after they suddenly received a hydraulic pressure of 26 atmospheres. There was no alluvium at the bottom? What kind of excuse is that? The liquid flowed fast through the gap and thus did not deposit but eroded, creating over the centuries the conditions the topographers described to poor Semenza. Thus the side was friable, certainly permeable, and, underneath, the massive pressure on the strata that could yield caused Toc to slide. The reservoirs created upstream from the dam, which could have provided an empirical test result, were put in place without being tested and without the order of the omnipotent state. The dam was too high. The law on this matter must be amended to state a legal maximum, let us say under 100 metres. But then the return on the operation would fall below the costs. Horror! The monopoly would not lose out, but only the consumption pattern of those who depend on it, the same being the case if the state were to act directly. Reformism, not only in Italy, flies this flag: the law passed, find the loophole. An old engineer who could understand geology, topography and building mechanics since he had an old-fashioned degree said that the dam could collapse now. Behind it there is no longer water, but a mixed deposit of water and earth (mud and slime) which, with its higher specific weight, could exercise a greater thrust. Here there are no models that hold good! The case is too indeterminate and even the computers come up with nothing. The Vajont basin was cut in two by the huge landslide with a volume higher than that of the water that it contained, a hill standing 100 metres above the water level. But the smaller lake remaining next to the dam can generate the pressure indicated by the aforementioned engineer. It all depends on the height, that is the total, and the density of the mud which will be decanted. The basin must be emptied, but not by blasting the dam with cannon-fire, but instead by installing syphons over it to replace the devices destroyed by the disaster and abandoning the potential energy which the turbine, if working, could have exploited. We cannot believe that the Ministry of Public Works could have thought that the wall would remain in place to support something the size of an Alpine lake. That sewer of death is no Alpine lake. The lakes formed during the glaciation between very deep indestructible rock walls and with a modest dam of natural morainic hills. They have been tested by Mother Nature over millions of years, not by a Technical Commission! Man certainly will win against nature. And will do so thanks to a science, a technology, an administration that will not be rented out to anyone. Before bending nature to our ends, we will have had to have bent the sinister social forces which enslave us more than millions of cubic meters of grave stones and which condemn the replies of today's experts to great rewards and grasping profits. We must dam the floods not of water and earth, but of filthy lucre. In 1917, the Italian army was forced back to the Piave river after the front broke at Caporetto (now Kobarid) on the Isonzo (now Soca). In the Third War of Independence, the Italians, having previously made an alliance with Prussia against Austria (8.4.1866), lost both on land (Custoza) and by sea (Lissa). Prussia, however, prevailed, and the good offices of Napoleon III assured Italy of Venetia all the same. The Adige and Mincio are two rivers on the Po plain. In fact "The names of rivers, lakes and mountains are generally masculine. (...) Exceptions are, however, frequent due to old reasons, thus la (fem.) Piave (and in modern and local use) il (masc.) Piave. " Alfredo Fansini Gramnatica Italiana (Palermo, 1982 (1933)) pp. 34-5. In Italian: "orrido", which means both gorge and horrible, fearful etc..